Rare Acquisition Opportunity! Stunning Aluminum Recreation True to the Original Car, V12 Powerplant, #1 of 6 Made. New Zealand based company Tempero Coach and Motor Co. Ltd, recreated six complete examples beginning in 1994. Fabricated from the original plans; Tempero went to great lengths to exactly reproduce the lines, methods, qualities and materials of the original construction. The aluminum body was built on an aluminum monocoque as specified. It features the modified E-type front suspension of the original and mirrors the mounting system for the Jaguar V12 engine, including a dry sump lubrication system that is mated to a ZF 5-speed DS5/2 transaxle. The actual dyno readings at the crankshaft are 291 hp and 331 ft. lbs. of torque at 5272 rpm. The engine is a correct 5.3 Liter V12 Jaguar engine, but despite the 4-cam racing version used by the factory for their prototype, Tempero used the standard 2-cam V12 Jaguar engine. This Tempero XJ13 is one of only six built, and was on display at the Blackhawk Museum in Danville, CA. The fit and finish of this all-aluminum Tempero XJ13 body is excellent, and the paintwork is complemented by the leather trimmed interior. The car was built with similar specifications such as the weight and dimensions. The interior has also been reproduced in a similar fashion with the gauges and dashboard of the XJ13. Rod Tempero stated that the windscreen is made from the original Triplex molds. This very small production run was built based on an original factory drawing. An all-aluminum monocoque was used, just as with the original. The instruments are identical to the original instruments used in the XJ13, even the windshield was created from the original mold used for the Jaguar XJ13. The car has phenomenal road handling capabilities and outstanding brakes. It is very nimble, responsive and a joy to drive. The motor makes all the right sounds, becoming a symphony at close to redline. This offering is the first of six completed as described in Peter D. Wilson's "XJ13 - The definitive story of the Jaguar LeMans car and the V-12 engine that powered it.". 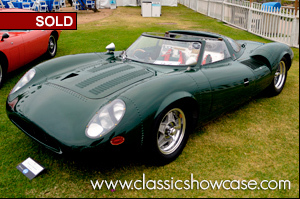 The car has been shown in JCNA sanctioned Concours events, and has placed 1st in class several times with scores of 9.992 at the 2016 International Jaguar Festival, 9.99 (in 2015) and 9.986 (in 2014) at the San Diego Jaguar Club Concours. The XJ13 is ready for the street or track, or as a spectacular investment grade vehicle. It can achieve top speeds of up to 200 mph, and is an absolute delight to drive on the road, or even more so on the track in the hands of a skilled driver. This car is welcomed at any car show, and a crowd pleaser wherever you go. In 1966 Jaguar produced just one example of the iconic and beautiful XJ13. It was an advanced prototype built to bring Jaguar back to the forefront of international sports car racing, specifically Le Mans. In 1971, before ever being raced; the original car crashed during production of a launch film promoting Jaguar's new V12 engine for the Series 3 E-type. That original car was eventually rebuilt, and now resides at the Jaguar Museum in Coventry, England. Numerous companies have tried to create a copy of this timeless beauty. None of them have come close!